Fall For Cotton Final Piece, originally uploaded by Lazy Seamstress. My dress was finished yesterday and I'm wearing it today. I'm pretty pleased with the result, and enjoyed sewing it up. I couldn't decide initially if the pattern was late 1950's or early 1960's, but seeing it sewn up, it has a definate 1960's vibe I think. The pattern was one I found at The Vintage Village in Stockport. A one size pattern with no markings other than punched holes to show the pattern piece number, the grain line and dart placements. The pattern had been used before, so notches were already cut out. Ordinarily I would have just used the pattern pieces, but following Rochelle's excellent post on tracing vintage patterns I was shamed inspired to trace this pattern, which I did using Fabribaste. The pattern came with scant instructions, more an order of work really, but that suits me just fine. I made no adjustments to the pattern which is a size 40" bust. I expected to have to take in the waist and hips, and looking at the modelled photos I probably could have, but my waist measurement fluctuates from 29-31" in just one day, so I don't like to fit too closely in that area. Plus, lets face it, I'm not going to wear 1950's/60's style corsetry every day, and although I do wear vintage inspired shapewear daily, they don't quite give that nipped in waist look on the pattern illustration. The pockets were constructed in an unusual way, at least I've never made pockets this way before; the side front panels were in two pieces, upper and lower. 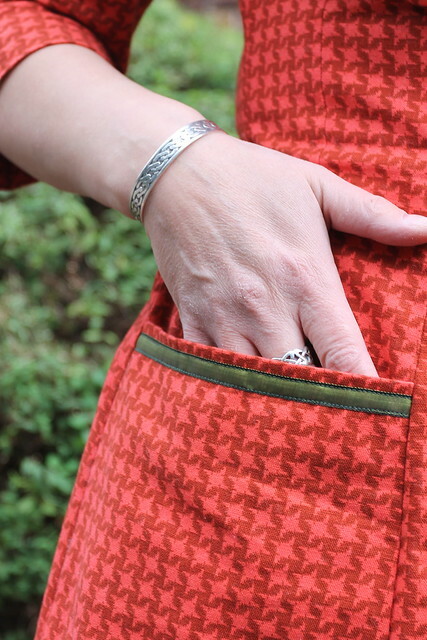 These pieces were joined and the seam becomes the bottom of the pocket by folding up the bottom piece, which is then secured in place with the side seam, and the pricess seam to the front centre. The princess seams were tricky as they are square at the top, more fiddly than anything, and I'm not 100% happy with my work on them, though of course only another seamstress would notice, and only then if she was looking really closely, so I will live with them. I trimmed the pocket edges and hem with some organdy ribbon. The zip is an invisible zip and was bought in a charity shop some years ago. The whole dress cost me less than £10, since the fabric was also bought for around £2 in a charity shop. The most expensive item was the pattern. 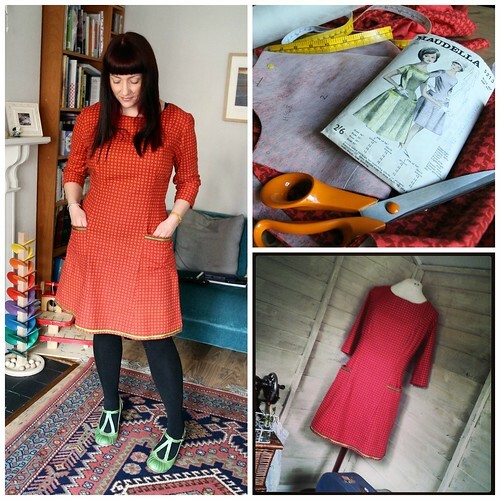 I've really enjoyed taking part in this sew along, and I think I will make this dress again in another fabric, this time a fabric that doesn't clash with my hair...though personally I like orange and pink together! 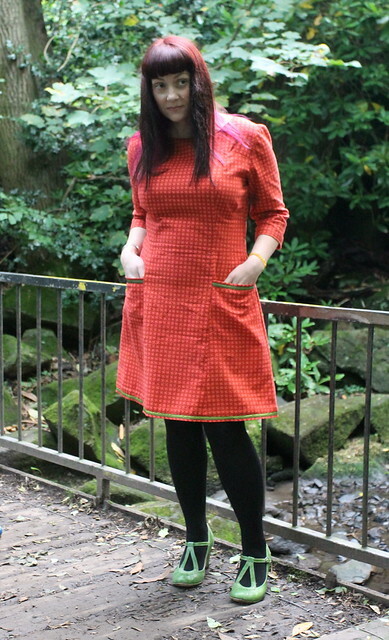 PS, I did press this dress, most of this photos were taken on a walk after a drive in the car, and this fabric creases! Thank you. 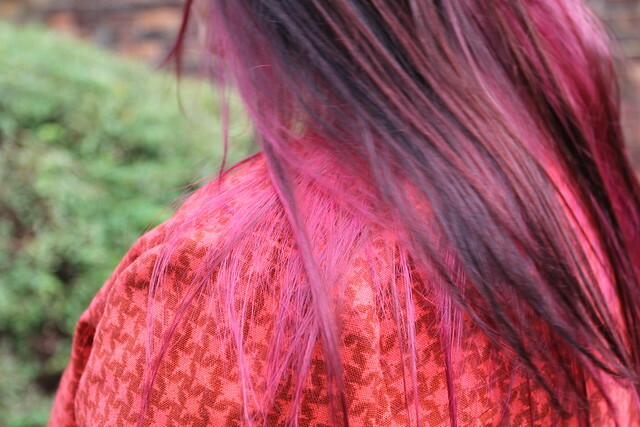 I'm not sure how long my hair is staying pink, I don't really like it. Oh thank you I have just spent a small fortune on patterns I have no wish to cut up, my mam taught me to trace pattern but I could not find the paper we used to use in the early `90s. I shall go look at the stuff you mentioned. You might have better luck searching for swedish tracing paper, I think that Fabribaste is the trade name for the same thing. 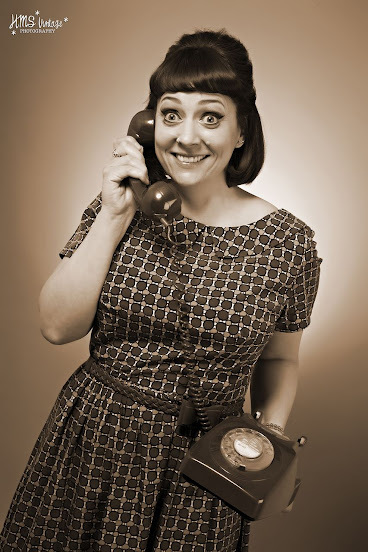 Love that dress, you have created a wonderful vintage dress. The colors of the dress certainly suits you and the fit is perfect! Great job! I shamelessly did not trace my vintage pattern but since it had previously been used I didn't feel as if I defacing it. But on those patterns that have not been cut I do trace, I just can't put my scissors to it. I'm usually one to cut, but I think in future I will trace my vintage patterns. I'll still cut the modern ones. Totally in love with this dress, especially the pockets. Your new hair colour is gorgeous too. 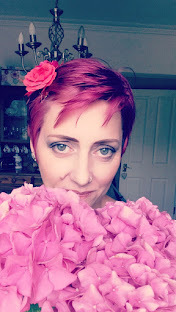 Thanks San, not crazy about the pink if I'm honest, just time to say goodbye to the blue and purple cos my hair can't take any more bleach. Love the dress and is does look more 60's now it is made up. I can't wait to see the next one you make! Cut out the next one today. it came out so cute! Love the fabric! This looks lovely! I'm off to hunt for a similar one! Fantastic skills you! Most envious of your talent.